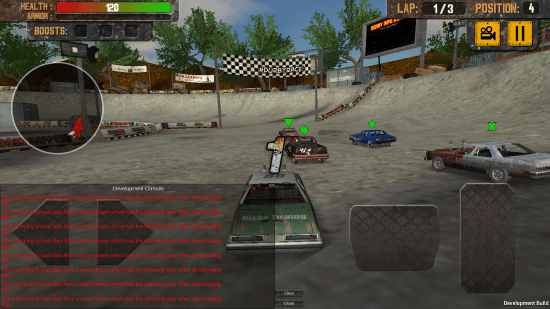 Demolition Derby: Crash Racing is a free racing game for Windows 8, published by Lunagames. This is an action packed, ultimate survival racing game, waiting for some real gamer to play it. Its a true American game, with American Muscle cars ready to demolish each other. Play in real 3D environment, and take down your opponents to win this racing game for Windows 8. Enjoy the realistic gameplay, along with awesome sound effects. Installing Demolition Derby: Crash Racing on Windows 8 Computers.. This is a 63.3 MB racing game for Windows 8. It can easily be found on Windows App Store, or just look for the download link at the bottom of this article. Click on Install button on the game page, and this game download and installs on its own. 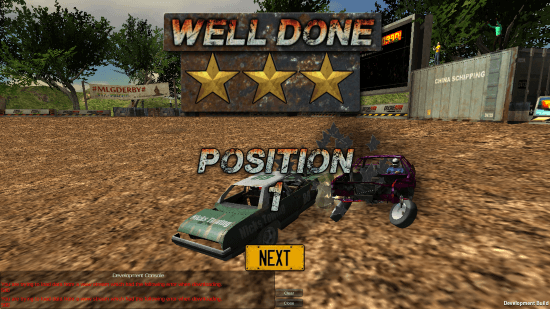 Playing Demolition Derby: Crash Racing on Windows 8 Computers.. This is simple, but entertaining game to play. Use the Navigation Keys, or the WASD keys to move your vehicle. Use Space Bar to apply nitrous. Click on Start to begin the game. You will be taken to the Map of this racing game for Windows 8. This map displays all the games available to be played. Different types of races are represented by different signs. Click on race to move forward and select a car. 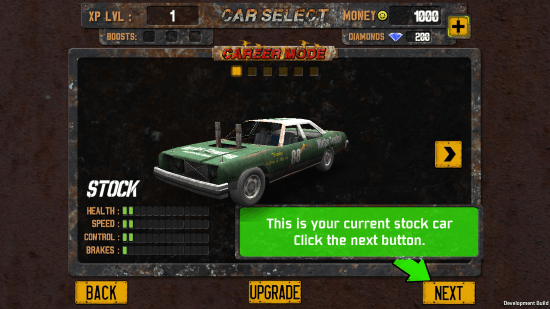 A bunch of deadly monster cars are available for you to play this racing game. Navigate to select a car, or to buy a car. The car’s Health, Speed, Control, and Brakes can be viewed at the bottom left corner of the screen. For each game, you get to select 3 boosters. You can get these boosters with the help of coins and gems. These boosters include: Armor, Nitro, Speed, etc. 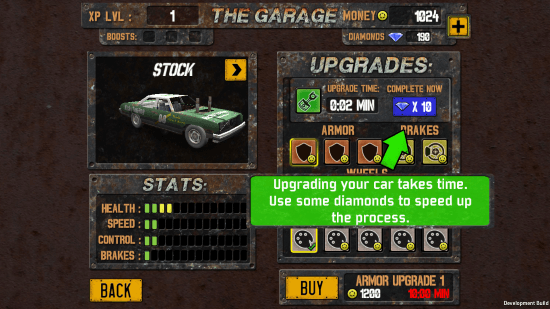 You can also upgrade your vehicle’s armor, brakes, engine, nitro, etc. Use the coins and gems to upgrade. 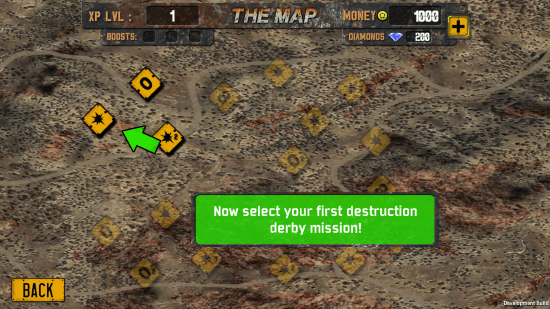 The first race happens in a dirt arena, where you have to take down all the card by smashing them. Green pointer over the car means the car is till up and running. Use nitro and speed to smash down the opponent’s muscle car. When you finish a race in this acing game for Windows 8, you are awarded with coins and gems. Winning races also increases the EXP level. 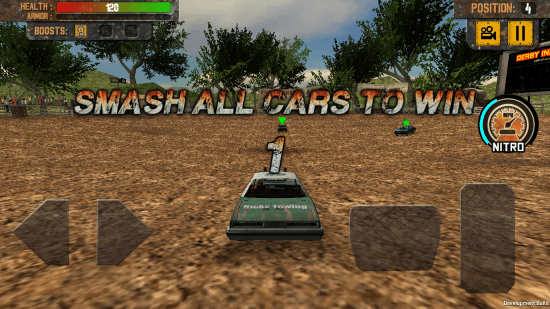 There are various other racing modes where you get to demolish your opponents and their cars. Install this game and find out for yourself. This racing game for Windows 8 displays some real 3D visual effects, and real game play.Customize your cars. modify car control system, experience realistic car damage, and much more in this racing game for Windows 8. 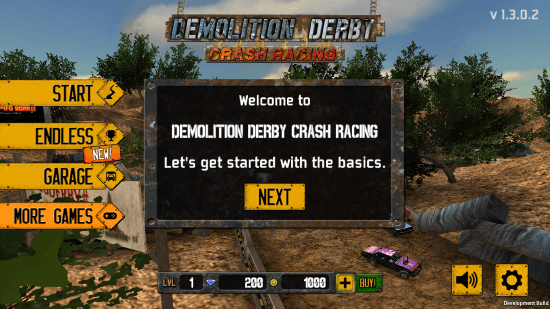 Install Demolition Derby: Crash Racing for Windows 8 and 8.1 computers.